Hugo is 12-inches of the upper body of what looks like a laboratory sidekick. He is vinyl with stuffed arms. If this were the end of the story, Hugo would give you plenty of creepiness for your collecting dollar. 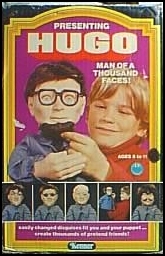 But Kenner made sure that Hugo was extra special by making a host of disguise accessories that you can temporarily glue to Hugo's head, giving him the capability for a large range (1000, Kenner boasts) of deformations. Oddly enough, most of the of the disguises end up looking like some variation of Moe Howard. Hugo seems to almost always come with his box but is rarely complete. A close to complete set can sell for as much as $75-$100.